University of Houston Law Center 3L student Mary Borrego, left, Stefan Casso '17, Julia Peebles '17 and adjunct professor Angela Odensky '14 celebrate their team's win at a moot court competition in Chicago. June 9, 2017 - Three University of Houston Law Center students brought home first-place hardware after recently winning the seventh annual L. Edward Bryant, Jr. National Health Law Transactional Competition in Chicago. The competition was hosted by the Beazley Institute for Health Law and Policy at the Loyola University Chicago School of Law. 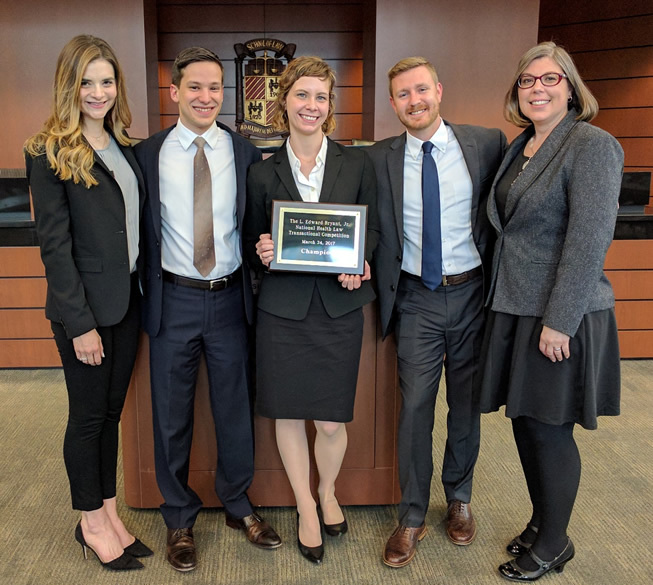 The winning students included recent 2017 Law Center graduate Stefan Casso, 3L Mary Borrego and Zachary Scott who will be beginning his 3L year in August. The team was coached by Angela Odensky, a 2014 graduate of the Law Center and a current adjunct professor and Julia Peebles, a 2017 Law Center graduate and L.L.M candidate in Health Law. "We at the Health Law & Policy Institute are so proud of these students' success,” said Professor Jessica Roberts, director of the institute. “We appreciate their hard work and dedication."